The Dashboard is the main page you land on when logging in to Maximus. This page makes necessary information from each of the 5 networks easily accessible. You can set several dashboard filters to customize which information is displayed, like the profit active account campaigns made during a specific month, or you can view the least active campaigns across all networks for the current week. Campaign stats can be filtered by date, networks, users, tracking types, and campaign status. For a more expanded look at the filters, click here. Filter data based on a date, including quick options like Yesterday, 2 Days Ago, and This Month. This dropdown menu provides three options. Click here to learn more about the Days filter. All Days: Show data for all days in the filter. Week Days: Show data for days Monday—Friday in the filter. Weekend: Show data for days Saturday and Sunday in the filter. Filter the campaigns based on a Maximus user. Useful for viewing different sub users under an account. Filter data based on its status. Archived Campaigns: View archived campaigns. Users can archive campaigns by clicking the “Archive Campaign” toggle in the Campaign Details page. To read more about the Reports and Charts for the Dashboard, click here. At-a-glance stats display a quick view of campaigns, spent, revenue, profit, profit margin, clicks, and sales. Click here to review in more detail the At a Glance Report for the Dashboard. These numbers are based on your chosen set of filters. The amount spent from campaigns with the applied filters. The total revenue from campaigns with the applied filters. The total profit from campaigns with the applied filters. The profit margin from campaigns with the applied filters. 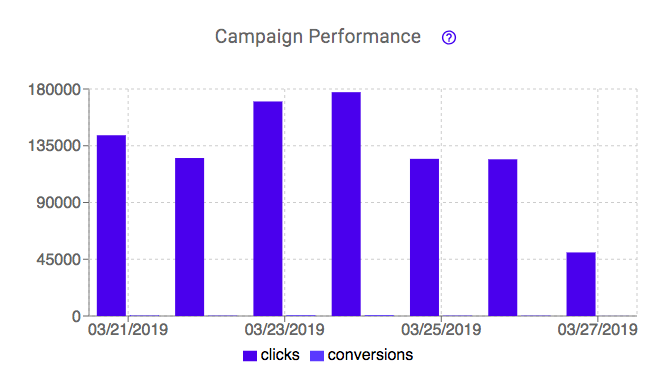 The total clicks from campaigns with the applied filters. The total number of conversions from campaigns with the applied filters. You can also view campaign data for highest-performing campaigns by clicking the report from the dropdown. Shows the most recent 10 campaigns created. This will also display their status and if the campaigns are still pending, have been approved, or have been rejected. Shows the 10 campaigns that have the most clicks. Shows the 10 campaigns with the fewest number of clicks, with a minimum of 1 click. Lists the 10 campaigns with the highest profit. Lists the 10 campaigns with the lowest profit. This includes campaigns that are losing money, if any. Click here to learn more about the charts on the Dashboard. Graphs and charts display information for available campaigns based on applied filters. View graphs and charts that show profit breakdown, campaign performance, and image performance. 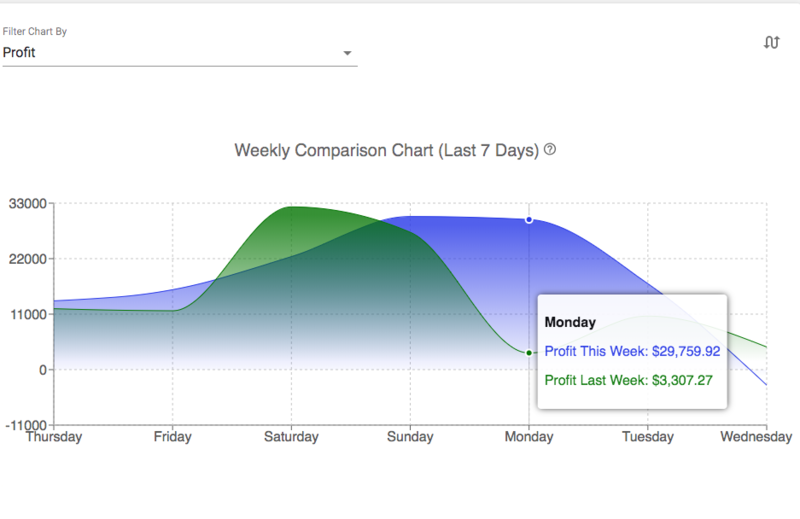 You can also hover over the graphs and charts to see the stats for those displayed days. Displays total profit for the specified date or time period. Displays the total clicks and conversions of the specified date or time period. Displayed as a double bar graph, allowing you to see the number of clicks compared to the number of conversions. Show the top spending images across the filtered campaigns. Click on an image to view the campaign details page for that campaign. 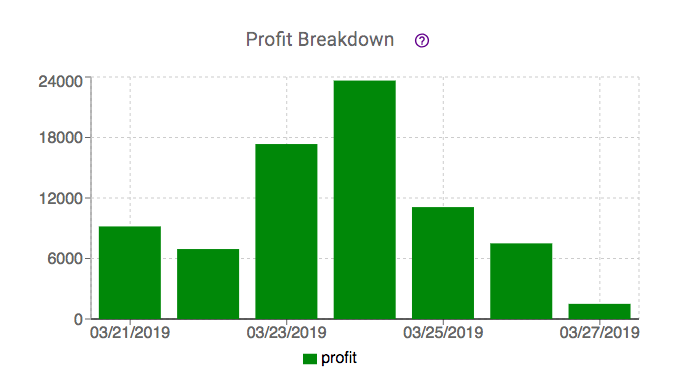 Displays the comparison of the Last 7 days with the previous 7 days before for profit, clicks and sales.